A team of UNIST students has won a gold award at a MSIT-sponsored business idea competition. From left are Tae Hun Chung in the School of Materials Science and Engineering and HyeWon Cho in the School of Life Sciences. 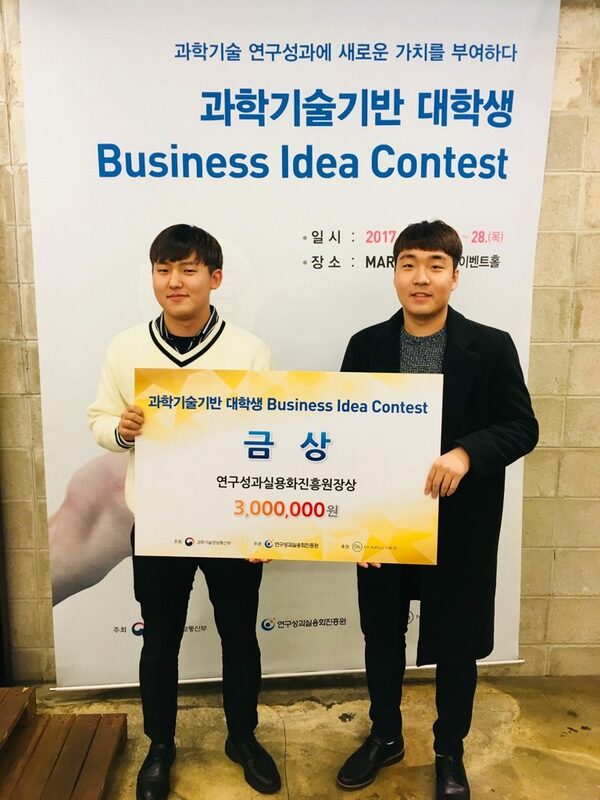 UNIST students won a gold award at a MSIT-sponsored business idea competition. Babies are born with highly malleable skulls, and therefore receiving constant pressure on a particular part of their head, like from repeatedly lying on ther backs to sleep, may lead to some positional flattening or molding of the head. A team of students at UNIST has recently introduced a smart baby pillow to help prevent and correct mild cases of flat head syndrome. This innovative device has also recently won a gold award at the ‘Science and Technology-based Business Idea Contest’, jointly sponsored by the Ministry of Science and ICT, the Commercializations Promotion Agency for R&D Outcomes, and the Asan Nanum Foundation. 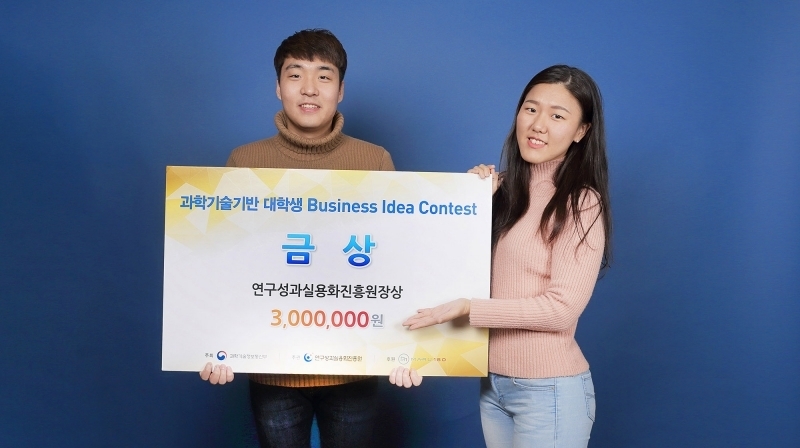 The winning team consists of the following members: Tae Hun Chung and Dong-Cheol Lim in the School of Materials Science and Engineering and HyeWon Cho in the School of Life Sciences. Flat head syndrome is the term, given when a child’s head is asymmetrical and flattened on one side more than the other. Although this does not harm brain development nor cause any lasting appearance problems, simple practices, like placing them in different positions over the course of each day, can easily prevent a baby from developing an asymmetrical skull shape. 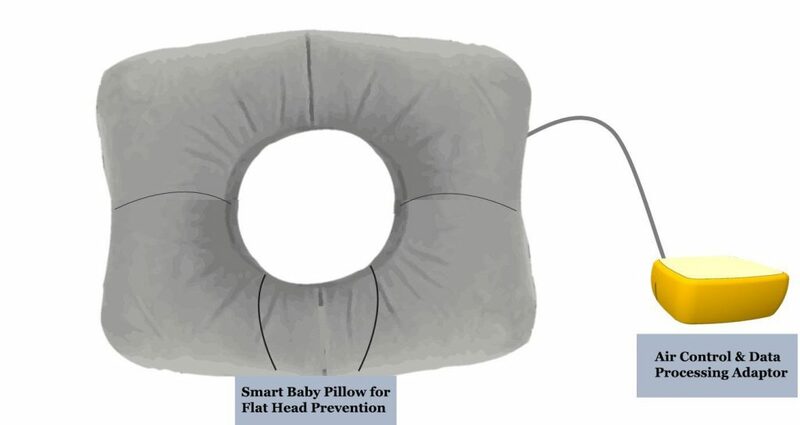 The new smart baby pillow is designed to help induce the correct sleeping posture, thereby preventing babies from developing flat head syndrome. This new device features an embedded air volume control system, as well as the image-based soft tactile sensor, developed by the Korea Institute of Industrial Technology (KITECH). Besides, this sensor was one of ten technologies presented in the competition, previously. From left are Dong-Cheol Lim and Tae Hun Chung in the School of Materials Science and Engineering at UNIST. The team plans to commercialize the product and later expand into the medical device market. The engineers behind this smart baby pillow expect that their product will be in great demand for both medical and cosmetic aspects, as it can drastically reduce the risk of cot death, as well as unusual facial asymmetry. By securing a financial aid from the Commercializations Promotion Agency for R&D Outcomes, they plans to build a prototype in the first half of this year. Behind their success is the UNIST Strategic Consulting Association (UNISCA). Consisting of both undergraduate and graduate students, UNISCA is the strategic consulting association at UNIST, focusing on providing a business’s successful and solid plans. “UNISCA has given me the tools necessary to successfully commercialize and launch a technology into markets,” says Tae Hun Chung in the School of Materials Science and Engineering. Organized by the Commercializations Promotion Agency for R&D Outcomes, the event aims to leverage and extend the potential application of advanced technologies to more users. In the competition, participants were offered to explore a total of 10 leading-edge nanotechnologies, previously presented by public research institutions. Students were, then, asked to explore the potential uses, current practices, and future directions of those technologies that scientists may have overlooked. The competition was attended by 40 teams from 20 universities throughout the nation.